Beautiful, feminine pieces made with eco-friendly materials are the foundation for rebe, a company founded by mother-daughter team Debra Weiss and Hillery Sproatt. The line is a well-edited collection of stylish accessories and clothing for women, children and even doggies! We spoke with Weiss to learn more about her company, including what inspires her unique work, what the future holds for the company and the secret behind that unique name! LoveToKnow: Debby, thank you for taking the time to answer some questions for us! Tell us a bit about your background in the fashion industry. What inspired you to become a designer? Debby Weiss: I have always loved textiles, and I studied textile design at U.C. at Davis. During my undergraduate, I made soft sculptures, clothing and designed my own fabrics. I only dreamed of the day I would be able to create my own collection inspired by fabrics from around the world. LTK: "Rebe" is such a fun, catchy name! How did it come about? DW: My daughter Hillery and I started Rebe in 2000. Hillery's middle name is Rebeka, and I often called her Rebe growing up. I think it was something special we shared, something bigger than a name. LTK: Eco-friendly attire is quickly becoming something of a norm in the fashion industry. What are some of the characteristics of your line that make it stand out from the pack? DW: I use a combination of eco-friendly materials, which is one of the reasons I believe my designs stand out over others. I create pieces to be eclectic in style and texture. My pieces combine recycled fiber and double knits, knits and wovens, vintage and new, geometrics and florals, all while using sustainable fabrics such as bamboo, organics, reused textiles and recycled fiber. LTK : What inspires your designs? DW: I am excited by strong, practical and feminine forms. I love vintage fabrics as well as textiles from around the world, particularly Indian and Japanese textiles. I believe that clothing is more important than what we throw on to cover up. It is an extension of our ideals and beliefs and can serve to inspire beauty and confidence in ourselves and those around us. Clothing is our second skin and it should be beautiful! LTK: Summer is here! What are your predictions for the season's biggest trends?DW: I often look to what is missing from the clothing industry so as to fill a void instead of following trends. I think we need new ideas, and people brave enough to think for themselves. I make things I want but cannot find - things that are born in my head. I am currently working on a new children's collection. LTK: If there is only one no-fail, timeless item that every woman should own, what do you think it should be? DW It should be something that makes her feel her very best. 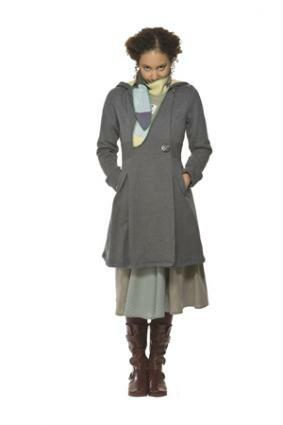 I think it is something different for everyone, but my Maryanne coat made from recycled fiber definitely falls into this category. LTK: Finally, what does the future hold for your company? DW: Lots of good things I hope! The economy is not making it easy but as long as people are looking for something practical and wonderful, we will be here. I hope to open up a store in San Francisco one day.